Bring the whimsical elegance of kate spade new york to your Christmas tree with the Tinsel Topper Silver ornament. 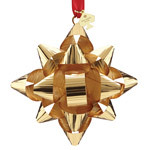 This Silver plate Christmas ornament is in the shape of a traditional gift wrapping bow. The Tinsel Topper Silver Christmas Ornament features a red grosgrain ribbon for hanging and a kate spade new york spade hang tag. This ornament is gift boxed.